A week away from blogging. I feel guilty. I've gotten all these visits (thank you for coming!) and haven't had anything new to show this past week. I've been really busy just trying to catch up with life and I have no computer - at least not the one I usually use. I'm using my old G3 (the blue one remember?) that has been sitting here picking up dust for a while. I had to take my trusty laptop to Apple to get some things taken care of and I won't have it for 2 weeks or so. Not fun. Him: "Did you backup all your files?" Him: "Did you backup all your emails?" Him: "Did you backup all the photos?" Me: "Oh yes of course!" Him: "Did you remember to back up all your bookmarks?" Me: A long moment of silence. "Ohhhhhh noooooooooo!" If I lose my bookmarks it will be a loss that I will grieve for a while. I have sooooooo many! At least I was smart enought to start using Bloglines so all the blogs I check out are in one place. The house is still not up to par but at least our yard is. I love it when my house starts looking the way it should! I have sore legs to prove how much weeding and planting I did on Saturday. My new header has a shot of one of the plants that I bought yesterday. This week I will continue on the inside. Some major purging of toys, clothes, stuff in general will be going on. In the midst of all this I've managed to 'drag' myself to a craft store and get some more stuff. 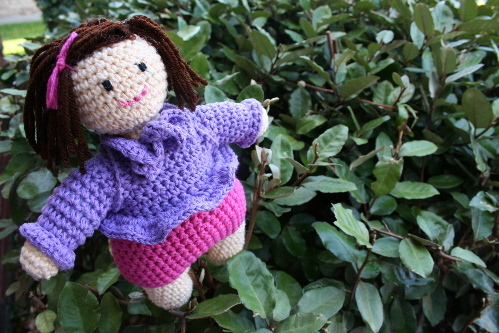 ;) I got some yarn and started a doll for little C without a pattern or plan of any sort. I just dove in. She turned out on the chunky side which was my intention but she's maybe a little too wide around the hips. Speaking of hips the whole week and a half I was sick I managed to lose 10 lbs. (some of that was gained in Colombia where we were eating like kings!). That was the least fun way to lose them but I'm glad I did so I'm going to take advantage of that and start drinking more water (I quit drinking coffee! *gasp*) and start back into my 1/2 marathon training. I'll be running it in January and I'm worried because I've fallen behind schedule. My training group is already up to the 5 mile run and I haven't even started because of the whole sick thing. Geeezz! Getting sick just messes up your entire life doesn't it?! So back to dolly... I finished her body in one afternoon but hadn't added her face so little C was very concerned. She kept telling me "eyes, mommmy, eyes!". I finally gave her a face and some hair on Saturday and yesterday I had to literally crochet as fast as I could because little C wanted to play with her badly but I still wanted to add a little something to the bottom of the sweater. At least she's already enjoying this doll more than the other one I made. Ana has been totally ignored! Oh well. I'm keeping her for myself as a reminder that the sewing machine is my friend. One of these days I'm going to have to take a sewing class to get over my insecurities in that department! What a cutie doll! Talented! I still smile knowing that your stuffies look just like your cards...but why wouldn't they? Great job. Your "C" is lucky.